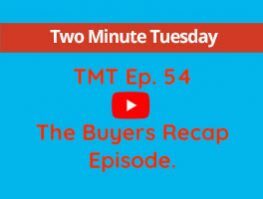 That’s right….. One year of TMT is celebrated this week with a Q&A episode with questions sent in by our clients. We never though when we started this road that the information we give out to our buyers and sellers alike would prove so popular. We have covered some amazing topics and the amazing positive feedback we have received has kept the format fresh and up to date. We have some exciting topics coming up in the next few weeks, however this week please sit back and enjoy this weeks episode which we recorded in the beautiful city of Seville recently……. So thank you for all your positive comments, feedback and encouragement. Enjoy.